COLOMBO, Sri Lanka - 11th Marine Expeditionary Unit (MEU), embarked aboard USS Comstock (LSD 45), arrived in Colombo, Sri Lanka, for a theater security cooperation (TSC) engagement, March 27. This is the second military-to-military exchange with Sri Lanka for the Makin Island Amphibious Ready Group (ARG) and 11th MEU during their multimonth deployment to both the Indo-Asia-Pacific and Middle East regions. 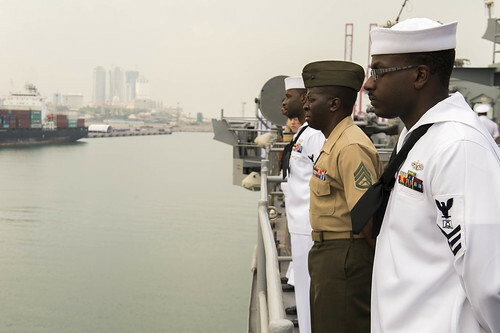 USS Somerset (LPD 25) and embarked Marines of the 11th MEU participated in a TSC with Sri Lanka Marines and sailors at Trincomalee Naval Base in November 2016. "This is a great opportunity to continue our partnership with the Sri Lankan Marine Corps," said Lt. Col. Patrick Reynolds, commanding officer, Combat Logistics Battalion 11, 11th MEU, and commander of troops embarked aboard Comstock. "This exchange is a unique experience for our young non-commissioned officers to impart our history, traditions, and training to the world's newest Marine Corps. The training will focus on the fundamentals of security operations and considerations for planning and executing humanitarian assistance/disaster relief operations." U.S. Marines will also work to provide increased familiarization of Marine Corps tactics and equipment to advance Sri Lanka Marine Corps' knowledge and expertise. Topics of exchange include basic offensive and defensive tactics; combat lifesaving skills; tactical convoy operations; humanitarian assistance and disaster relief training; and amphibious assault vehicle familiarization. The Comstock crew will host their Sri Lankan navy counterparts for shipboard tours and familiarization of naval damage control procedures. Additionally, Sailors and Marines will have an opportunity to conduct an outreach project at an orphanage and experience the culture of Sri Lanka. Finally, sporting activities and a concluding BBQ reception will round out the activities, allowing forces from both nations to build bonds in parallel with training. Approximately 325 Marines and Sailors from the Makin Island ARG/11th MEU and 175 Marines and Sailors from the Sri Lankan navy and Marine Corps are expected to participate in the TSC. The U.S. units involved are Company B, Battalion Landing Team 1st Bn., 4th Marines; Combat Logistics Detachment 113, Combat Logistics Battalion 11; and Comstock. Comstock, assigned to the Makin Island ARG, and embarked 11th MEU are on scheduled deployment to the U.S. 7th Fleet and 5th Fleet area of responsibilities. ARG/MEUs provide senior U.S. military leadership and coalition partners with a flexible force, which can rapidly respond to contingencies and crises within a region. With ships, aircraft, troops, and logistical equipment, the ARG/MEU is a self-contained and self-sustained task force capable of conducting a variety of missions from combat operations to providing humanitarian assistance.